"Great website Will, I have lots of memories of the "Buggie Lawn", the Dummy, Bully and Dalmarnock School. I was born in 209 Baltic Street in Oct 1952, moved to my grannies close No. 223, at the Dunn St. corner around 1957 until the building came down in 1968. My Granda Wullie Inglis (born 1900) owned the Dalmarnock Foot Clinic on Dalmarnock Rd. between Fairbairn St. and Ruby St. He Was also a trainer for Bridgeton Waverly and "cut man in the 1920's -30's for the bare knuckle fighters round the "Bully" at Walkinshaw St and Dunn St.
My family dates back to the early 1900's in the Street, my Grannies maiden name was Bingham, they had the wee fruit shop facing Arrol's in Dunn Street, just up from Baltic St corner. before it closed in 1965 it was called "Sybil's" after my dad's sister who was Sybil Sinclair married to Jackie S.,(sons Billy and Tommy) also of 223 Baltic St. I remember the penny Vantas drinks she sold and the penny check-machine in the corner of the shop. 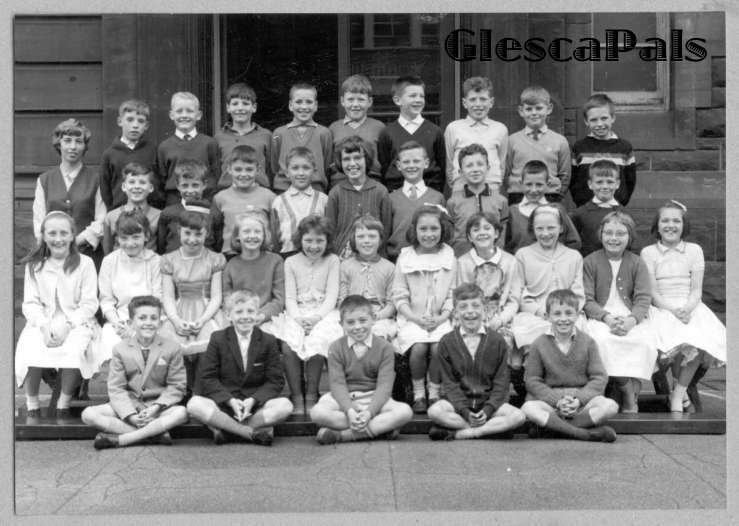 I've attached a 1962 Dalmarnock School photo with most of the names of my classmates." Jan.2003, Extract from e-mail, Bobby Thomson, Kent, England. "Just to let you have another name to fit a face. 2nd Row, number 10, the little girl with the specs is Carol Ann Richardson, who has now been married to me for nearly 32 years and we live in Sittingbourne, Kent. (no 11) is Sandra Manners. The first in row three is David Gordon Stevenson and no. 5, the girl in the middle is Ann Mitchell. No. 3 in the front row is John Vickers. I remember the teacher was Miss Walker. How nice to see this after all these years. The last time I saw Joyce was in Spain in the 80's, she was a tour rep. for a holiday company. I've never seen any of the others since school. I've lived in London since 1989, don't go back any more. Hope this info helps. Sandra. So, its taken 50 years to see her pic. & read her words again & this only goes to prove" everything comes to he who waits". Thank you Webmaister, Will McArthur, your site will receive my donation.